After menopause the risk of breast cancer, heart disease and osteoporosis increases. 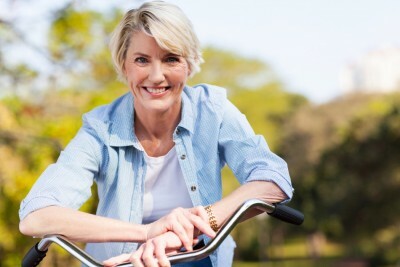 Many women also report weight gain around the time of the menopause. This is not caused directly by the hormonal changes but is associated with getting older, having less muscle mass and being less active. With all this going on there is a lot to think about diet wise and a lot of conflicting information around. So here are my top evidence-based tips for thriving through the menopause. If you do experience weight gain around the time of your menopause it’s important to take action to get your metabolic rate up. One way to do this is to use resistance training to build muscle. This helps because muscle is more metabolically active than fat so the more muscle you have the higher your metabolic rate will be. You could ask for advice from a personal trainer at the gym or check out the videos and advice at the NHS Fitness Studio link below. Diet wise make sure you have good quality protein from meat, fish, eggs, dairy or soya products at every meal. As we get older we tend to break muscle down more readily than we make it. If we don’t get a regular hit of good quality dietary protein it’s hard to build muscle even if we exercise. Another way to raise your metabolic rate is through interval training. You can try popular programmes such as “HIT” at your gym or you may just prefer to do some circuits designed by a personal trainer. However you don’t have to spend lots of money or join a gym. Try running in intervals. Run as fast as you can for 1-2 minutes then walk at your normal pace to recover. Then run as fast as you can again and repeat this about 6-7 times. The actual programme that’s right for you will vary, so listen to your body and do what works for you. If you already have a medical condition it’s essential that you consult your doctor before you start an interval training programme. Maintaining a healthy weight will also reduce your risk of breast cancer and heart disease which are both more common in post-menopausal women and it’s the best way to reduce hot flushes. Phytooestrogens – These are substances from plants that have chemical structures similar to those of the female hormone oestrogen. The isoflavones found in soy and red clover are examples of phytoestrogens. Flaxseed is another phytoestrogen source. Studies of flaxseed products found them to be no more effective than a placebo (an inactive substance) in reducing hot flushes. Studies that tested isoflavones for their ability to relieve menopausal symptoms have had inconsistent results and many of the studies were not of high enough quality to give any useful evidence. Studies that were robust showed that you need 50-150mg isoflavone every day to see any benefit in terms of symptoms. This is hard to achieve from dietary sources. Supplements are not well regulated so they may not actually contain the amounts stated on the pack. Ask your Diettitian for advice about the quality of any product you are interested in. Phytoestrogens appear to be safe for short-term use, but their long-term safety hasn’t been established. Because phytoestrogen supplements may have effects like those of the hormone oestrogen, they may not be safe for women who shouldn’t take oestrogen so always check with your Doctor. Phytooestrogens are not suitable for women taking anticoagulant medication so again talk to your Doctor about your options. Equol – This is produced by bacteria in the guts of 30-60% of people when they eat soya products. There are reports that people who are equal producers experience noticeable relief from hot flushes. There is also some information to indicate potential benefits in relation to bone health and the prevention of heart attack, stroke and some types of cancer. Equol is available as a supplement in the form of s-equol. Taking equol supplements is probably safe for most people when used for up to one year but we don’t have enough high quality research to say for sure. There are reports of mild side effects such as constipation, bloating, dizziness and allergic rashes. The effects of equol in people with breast cancer are unclear and some studies have indicated that it might contribute to the growth of tumours. Women with breast cancer, a history of breast cancer, or a family history of breast cancer should avoid using equol until more is known. Black cohosh – This is a herbal product sometimes recommended for the alleviation of a range of menopausal symptoms although the research evidence is inconsistent. A few cases of very serious liver damage have been reported in people taking black cohosh products. Whilst we don’t know for sure whether black cohosh was responsible for this it is not recommended for anyone with liver disease. Anyone taking it who experiences abdominal pain, dark urine, or jaundice, should stop using it and speak to their Doctor. Given the lack of evidence of benefit it is not a product I recommend. Dehydroepiandrosterone (DHEA) – is a substance that’s made in the body, where it’s converted into the hormones testosterone and oestrogen. DHEA production decreases as people grow older but we don’t know for sure if this is linked to menopausal symptoms. Again there are reports of serious liver damage in people taking DHEA as a supplement and so it is not something I recommend. Dong quai – This is a traditional Chinese medicine used for women’s health problems, including menopause. However, very little research has been done on dong quai, so no conclusions can be reached about its effects. Dong quai may interact with the anticoagulant (blood-thinning) drug warfarin. Kava – This product which is sold as a tea or extract is made from the Piper methysticum plant which grows in the Pacific islands. There are serious concerns about the safety of kava and it cannot be sold in the UK although of course it is available on the internet. Kava is not recommended as there are significant concerns about its safety. Evening primrose oil – There is no robust scientific evidence of benefit for menopausal symptoms. However it is likely to be safe when used by menopausal women for up to 1 year. Don’t use it if you have a bleeding disorder, schizophrenia, epilepsy or seizures related to other causes. Consult your surgeon if you are due to have surgery for any reason and you are taking evening primrose as it may affect bleeding during or after surgery. If you are thinking of trying any herbal supplement please discuss this with your Doctor and Dietitian first. Some things we eat have a protective effect during the menopause, reducing your risk of heart disease, stroke, breast cancer and osteoporosis. Others have a detrimental effect increasing risk of disease. Here is a summary. Fibre – A good fibre intake reduces your risk of heart disease and breast cancer plus it’s good for bowel health and helping you feel fuller for longer. Make sure you have fibre from a variety of different sources so you get soluble and insoluble fibre. Good sources of soluble fibre include fruits and vegetables and oats. Insoluble fibre helps reduce your risk of breast cancer and helps keep your bowels regular. Good sources include wholegrain foods like wholemeal bread, brown rice, wholegrain unsweetened breakfast cereal and wholemeal pasta. Fats – Omega 3 fats help reduce your risk of heart disease, stroke and cancer. Include 1-2 portions of oily fish each week eg salmon, fresh tuna, mackerel, sardines and pilchards. If you don’t like fish include more nuts and seeds like walnuts, flaxseeds and chia seeds. We all need some fat but too much is not helpful because it’s packed with calories. Measure fat and oil when cooking and use oils with a good amount of omega 3 fat such as rapeseed oil. Choose lean cuts of meat and check labels. Choose low fat dairy products. The jury is still out on saturated fats so until all the evidence has been evaluated the advice is to keep saturated fats to a minimum, so check labels and look for products low in saturated fats. Dairy products and alternatives – These are essential for calcium. The best way to make sure you are getting enough is to have 2-3 portions of dairy foods/day eg milk with cereal, a glass of milk to drink, a matchbox sized piece of cheese or a yogurt. Remember that low fat dairy products contain just as much calcium as full fat. If you don’t eat dairy make sure that the substitutes you use have calcium added. Alcohol – Too much alcohol increases your risk of cancer and adds a lot of calories. It’s also bad for your bones. Stick to a maximum of 14 units/week. Remember a unit is a small glass of wine or single measure of spirits. Salt – Too much salt increases your risk of high blood pressure and hence heart attack and stroke. It also weakens bones. Don’t add salt at the table and use herbs and spices instead of salt to add flavour to food when cooking. Cut back on processed foods and check labels to make sure any processed foods you do have are low in salt. Caffeine – Too much will weaken your bones and may keep you awake at night. Keep your intake down by choosing caffeine free drinks like herbal tea and Roiboss or decaffeinated products. Avoid caffeine containing fizzy drinks like cola and sports/energy drinks. Keep coffee to two mugs/day and have it in the morning. Finally remember that any period of change in life is an opportunity to take steps to make things better. So review your diet and lifestyle and take action to enjoy good food and good health throughout the menopause and beyond. This entry was posted in Ages and Stages, Menopause by Stephanie.fade. Bookmark the permalink.